Our Mission Statement: Ocheami is an African Arts organization that aspires to promote healthy, holistic lifestyle practices, cultural competency through education and cultural development, independently and in collaborative ventures with other organizations. We are a group of artists and educators with a common goal, to study, share and perform West African culture to support healthy perspectives of life. 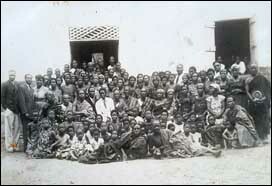 Ocheami means linguist, the representative who speaks on behalf of the chief in the Ga Language of Ghana, West Africa. 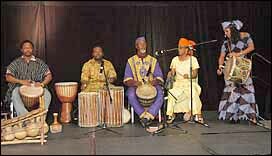 Ocheami are "performers speaking on behalf of West African people through drumming, dance, song and storytelling." Ocheami is currently celebrating their 30 plus years of providing excellent programs in these disciplines. Ocheami's purpose is to share West African culture by providing authentic, quality instruction and performances in African Arts -- and to have these experiences accessible to all. 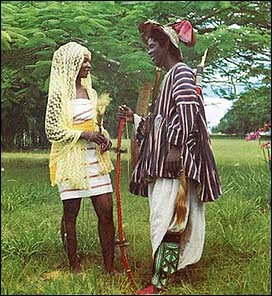 Primary to the group's work are Kofi and Amma Anang. Kofi Anang, Artistic Director is a graduate of the University of Ghana, Department of Music and Dance. 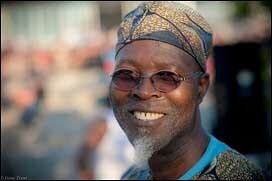 He performed with the Ghana National Dance Ensemble throughout the world from 1965-1972. Kofi was lead dancer and musician with the Late Obo Addy (a well-respected Ghanaian Musician) from 1972-1977.That group was called Oboade and included brothers Yacub, Ismael and Mustapha Addy. Incorporating his talents as a dancer, drummer, teacher and choreographer, he co-founded Ocheami in 1978. Amma Anang graduated from Mills College (Oakland, CA) with a Master of Arts - Social Services, spent 10 years as a Student Affairs College Administrator and currently is working as a social worker for a local nonprofit. Working with primarily Black youth who are at risk for the “School to Prison Pipeline”. 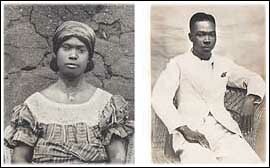 Amma aided Kofi in founding Ocheami, and currently volunteers as business manager, dancer and other duties as needed. There is a downloadable Ocheami Study Guide available at ocheami.org/lrg/Ocheami_Study_Guide.pdf. The 23-page Study Guide contains illustrations of some of the drums used in the program as well as information about the country, people and culture of the West African nation of Ghana. This guide is offered at no cost or restriction when used in non-profit educational settings. Ocheami's Culture Club has been funded by the Seattle Department of Neighborhoods, Seattle Parks and Recreation and the Children's Museum. Ocheami is a highly-respected ensemble that has toured nationally and internationally, teaching and performing at various schools, colleges, universities, libraries and major corporate events. They are especially well known in the Puget Sound region for their educational and residency work. 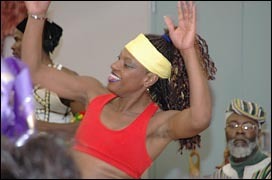 Dora Oliveira has performed and taught Afro (African) Brazilian dance for 28 years. A graduate of the prestigious Federal University of Brazil, Dora's career as a professional dancer began in 1976, when she joined renowned Brazilian Folkloric dance troupe, Exaltacao A Bahia. Dora commands a repertoire that ranges from Afro-Brazilian dance forms through Jazz, Ballet, Modern and African dance. Ms. Oliveira moved to the US. in 1991 and has performed with Ocheami over 21 years. Guests' performers are often invited to perform with this core group. Ocheami is a highly respected ensemble that has toured nationally and internationally, teaching and performing at various schools, colleges, universities, libraries and major corporate events. They are especially well known in the Puget Sound region for their educational and residency work. In 1998, Ocheami was the recipient of the Gordon Tracie Award for their significant contribution to the development and presentation of traditional arts in the Northwest. This award is given annually by the Northwest Ethnic Heritage Council. 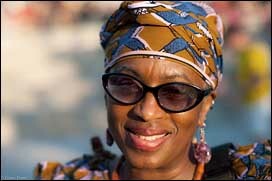 Ocheami has enjoyed being featured on numerous Seattle TV programs and were selected as a key presenter at the International Festival of Puppet Theater in New York City (sponsored by the Jim Henson Foundation) in September 1998. Performed “Sigi The Antelope” - three African Folktales in collaboration with the Northwest Puppet Theater. Ocheami is also honored to have performed for the 44 President of The United States of America, Barack Obama. Ocheami is also honored to have performed for The President of The United States of America, Barack Obama. Ocheami is an educational cultural development organization that aspires to promote healthy holistic lifestyle, cultural competency, in collaborative ventures with other organizations or independently through African Arts. 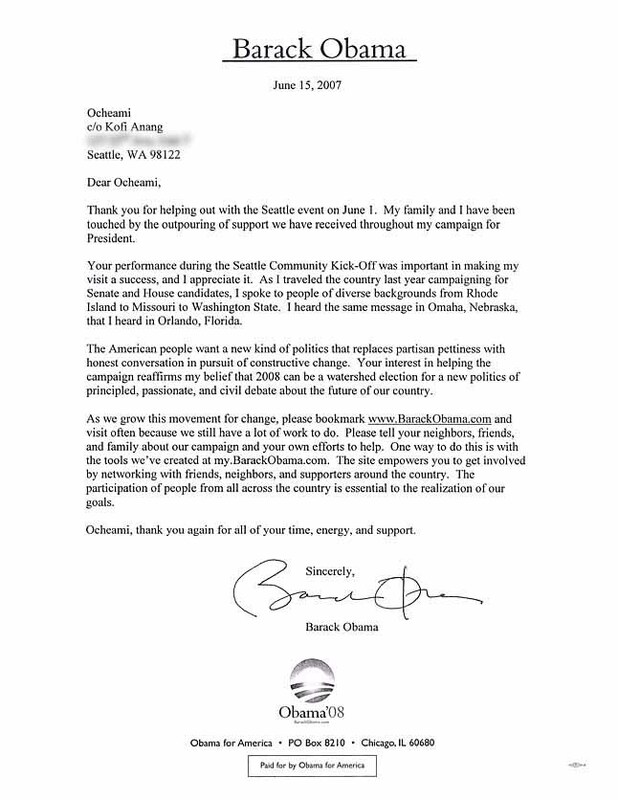 On June 1st of 2007, Ocheami performed at the Seattle Community Kick-Off of the Barack Obama presidential campaign. You may read now-president Barack Obama's thank you letter to Ocheami here. Ocheami is registered by the IRS as a tax exempt 501(c)3 corporation.